In mid-July my girlfriend and I embarked on a five-week road trip which took us through eight states and over thousands of miles. We didn’t set out to do a tour of National Parks, but our journey from Texas to California and back was punctuated with day trips through these gems. Each park, even those next door to one another, has a different personality. Along the way their incredible vistas and natural beauty inspired a sense of pride in my country that had long laid unstirred. It’s not a mean or ugly pride that politicians pander to, but rather the feeling that I’ve gotten to know my country better. 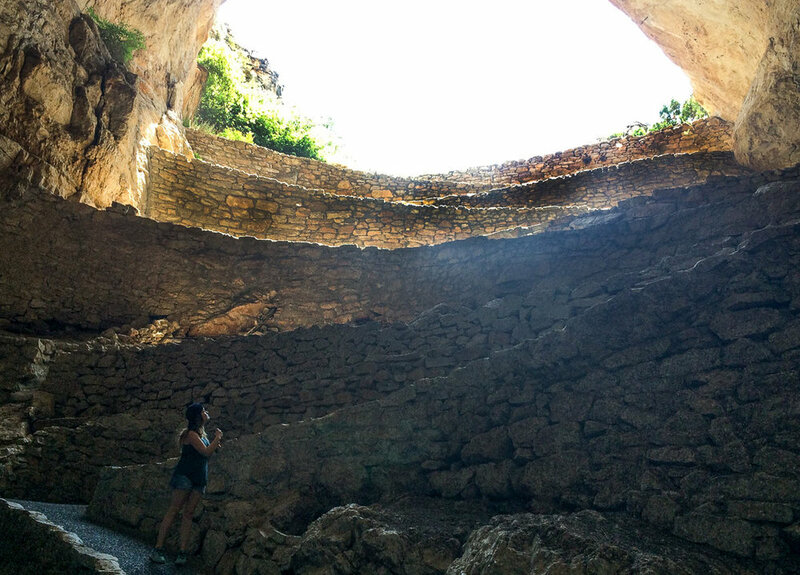 f you’re into hiking but can’t take the heat, try entering the cave through the natural entrance. It adds about an hour to the tour but there’s nothing like walking into the great yawning mouth of this cavern. The pathway takes you down a myriad of switchbacks from the light of day to what looks like pitch blackness. The trail within the cave is well lit, but relative to the sunlight it’s nearly imperceptible. The interior of the cave is filled with fascinating natural formations formed slowly over thousands of years. Standing in the 8.2 acre Big Room we are reminded of how fleeting our time on Earth is and how small we are. The Petrified Forest National Park is the site of a prehistoric swamp. In the swamp there grew enormous trees which toppled over and as millennia passed the trees were fossilized. Today the swamp is gone and we see massive ancient tree trunks made of beautiful stone strewn about the desert. The park is situated just south of the Painted Desert Wilderness Area that is over 43,000 acres of magnificent vistas in which adventurous hikers and campers may lose themselves. A drive north from the park entrance takes travelers through a remarkable landscape of craggy hills striped with bands of naturally occurring color. It looks like something from a Seuss book. There are ruins of pueblos, ancient petroglyphs, a dinosaur museum, a shrine to Route 66 in the form of a ‘30s era Studebaker on a plinth and there’s the gorgeous Painted Desert Inn. Originally constructed of petrified wood , this lovely building is almost a century old and is still in use. The next park we hit was the big one, the Disneyland of National Parks, Grand Canyon National Park. Because we made no reservations we had to stay well outside the park. After battling traffic to get to the gate and paying $30 to get our vehicle inside, I wondered if it was worth it. Looking back, I wish I had purchased a National Parks annual pass at this point. If you’re planning a similar trip to multiple parks, or think you may hit more than two this year, consider getting a pass. It costs $80 but ends up saving you $10 on your third park, and then you get into the rest free. We visited the South Rim. The visitor’s center has a wonderful documentary to get folks out of the sun for about 20 minutes. I walked out of the film with a richer understanding of the history of this region and the people and forces that shaped it. Language falls short when trying to describe the majesty and immensity of the Grand Canyon and photos only tell a fraction of the story. The experience of standing at the rim looking in, the wildlife and nature that surrounds you is immersive and overwhelming. 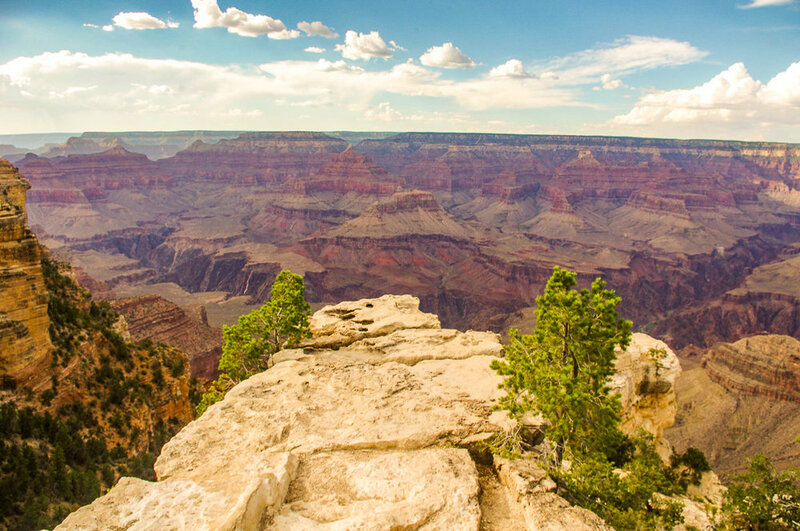 If you are going to one National Park in your life, make it the Grand Canyon. In California we visited Yosemite. 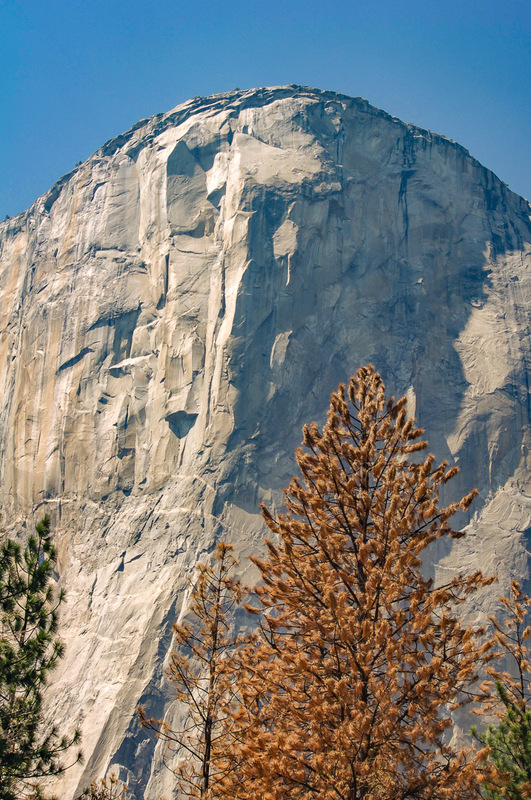 The region around Yosemite is experiencing drought conditions that make conifers susceptible to tree-killing bark beetles. When approaching the park you are surrounded on both sides by trees turning brown and crews cutting them down. However, once inside the park you’re greeted with green trees and a wealth of natural beauty, including waterfalls cascading down granite cliffs. There are lovely meadows that make for perfect photo opportunities. If you find yourself there in the summer make sure to go swimming. The area’s many creeks and rivers are of exceptional clarity and are a great way to get in touch with the natural setting. Visiting National Parks is a little like traveling back in time. These places have been set aside by forward-thinking leaders from the past. The National Park System can trace its roots back to this park. In 1864 Yosemite was made a protected public use area by Abraham Lincoln in the midst of the Civil War. If you’re heading east out of Yosemite don’t miss Mono Lake. It’s an ancient salt lake in the middle of the desert with unique mineral formations called Tufas that make the landscape other-worldly. 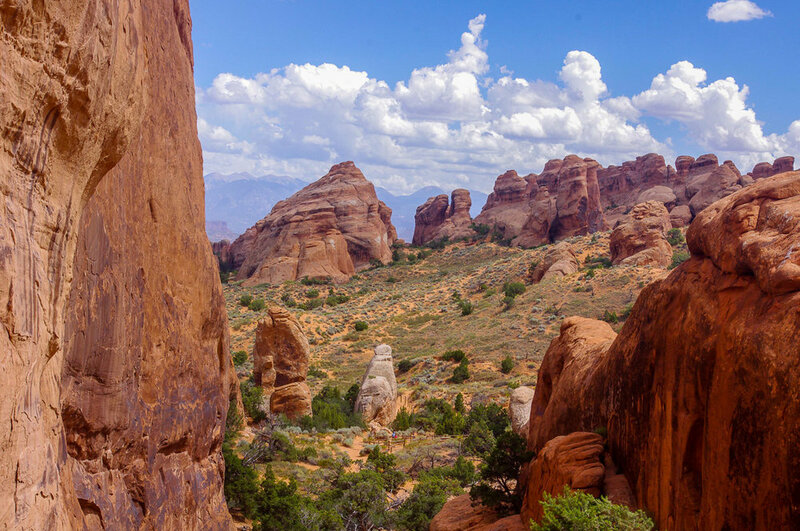 Southern Utah is peppered with National Parks and consequently some of the most breathtaking terrain we encountered on our trek. Moving west to east we visited four parks: Zion, Bryce Canyon, Capitol Reef and Arches. 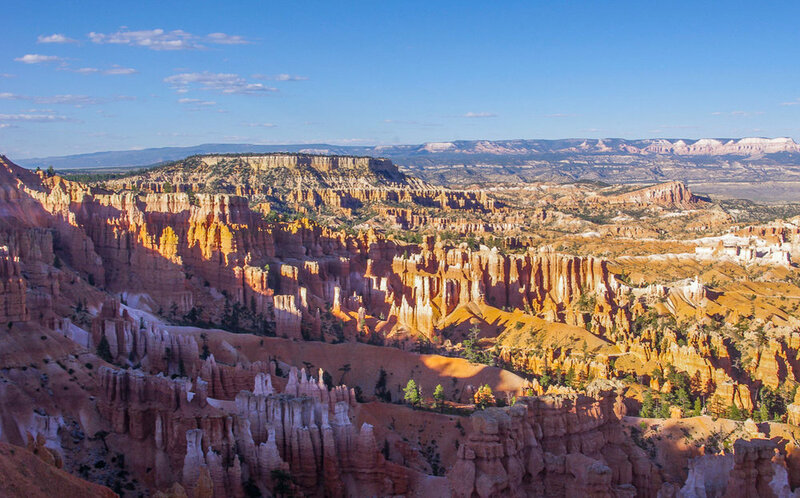 Of the four, the incredible vistas at Bryce Canyon and Arches were most memorable for me. 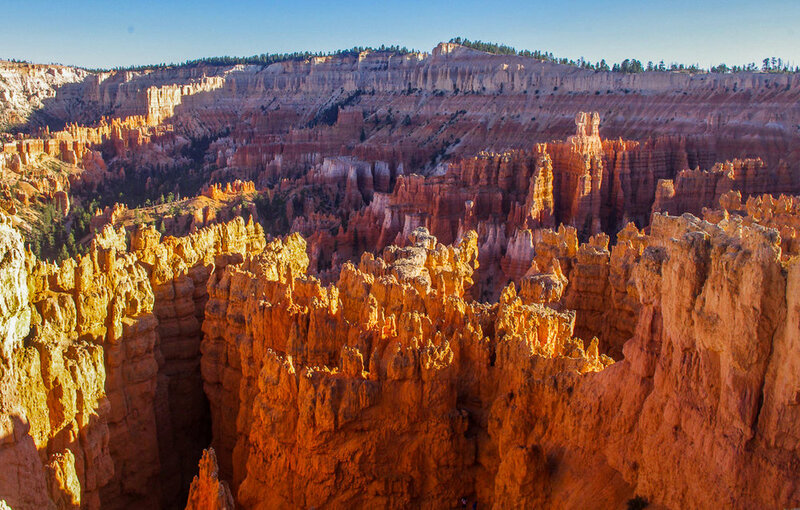 Bryce Canyon, like other canyons, is the result of weathering and erosion. However, unlike most other canyons, flowing water takes a back seat to a process known as frost-wedging. The result of this is a stunning landscape populated with uncommon rock formations. These natural stone pillars are called hoodoos. Arches National Park was perhaps my favorite place to hike of the whole trip. There are easy trails leading to a number of the natural attractions here. If you’re feeling more adventurous you can leave the paved path to strike out on a less well-worn one. The payoff for doing so is a memory to last a lifetime. 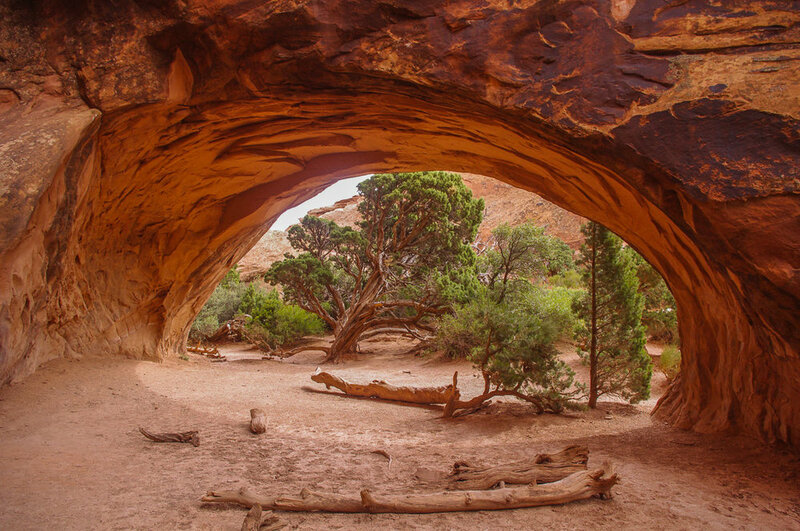 The natural arches here are extraordinary. The orangey-red rocks surrounded by desert scrub and sage seem to glow under the backdrop of perfect azure. 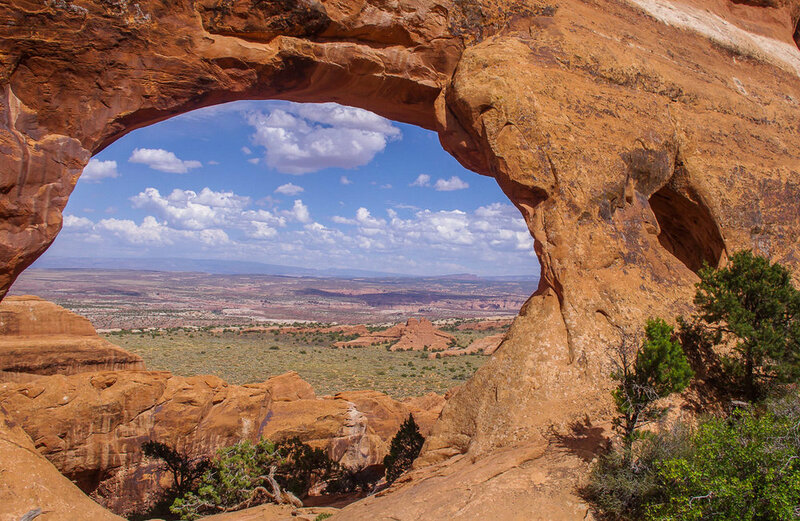 In Arches National Park I was reminded why I travel. I do it to expose myself to the unknown, to reach out and see what the world has to show me, and occasionally, when I’m fortunate, to be overwhelmed and humbled by the experience. Aaron Vick Starnes is a freelance writer who is passionate about travel, DIY projects and anything with wheels, wings or sails. Follow him on Twitter @AaronVStarnes for more of his work. Hot Springs, Arkansas is a delightful place to spend a weekend (or longer) where you can indulge in spa treatments and get out into nature. Julia shares her experience seeing the Northern Lights and tells us how to see them in Denali National Park.